Fortunately I've been studying in my lamp all night. A change on Dorothy's middle name and a restoration of Nancy's first gives you the gracious and lively Vivica Anne. Do I pass the test? Hi! I have two girls and one boy: Spencer, Sloane and Sawyer. We are expecting our fourth - a boy! We want his first name to start with "S" like his siblings. His middle names will be Memphis Faulkner. Can you help? Ah, smart mom. This way, when you yell at them, you can start the "s" and hold it while you try to remember the rest of their name. Very clever! When the youngest gets in trouble, just remember his name is Stewart. 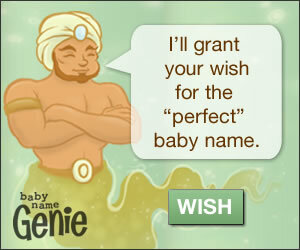 Looking for a baby boy's name. Middle name is Rex; last name is Hayes. We want the first name to start with T. No Thomas, Tim, Troy, Tristan, Tho or variations of them. If you must have a T. Rex in the family, name him Theodore and call him Teddy when he's young. Then hope that everyone's sense of humor doesn't go extinct. Here is a challenge for you: My husband and I are both Latin. My first son's name is Elias Alexander Leyva. I want to name my second son Ariel Jesus, but my husband disagrees. He thinks Ariel is a girl's name. I want a name with the initials A.E. Can you come up with a nice Biblical name? You can thank Walt Disney and his mermaid for ruining the boy's name Ariel for you. Instead, try Aaron Ezra for a name perfectly suited for a young man. I can see that when it comes to your daughters, you're off in La-La Land. Name your daughter Kala Gray, and she'll fit right in. I'm having a baby girl in 2 months and we can't decide on a first or middle name! We want something that incorporates my German heritage but isn't TOO German sounding, like my own name. We want a very powerful name, something that would stand out. Our last name is Smith if that helps! For the perfect name your daughter can proudly take back to Deutschland when she visits, name her Adalecia Giselle. She'll be sure to say "danke." We are looking for a girl's first name; her family name is Wen. We have been trying pregnant for a long time, and we got everything ready to do IVF, but find pregnant naturally right before treatment. We wish a name meaning gift, luck, or compassion. Many thanks. Wen, in doubt, ask me. Congratulations on your baby daughter, who is anything but luck. I give you Eleanor Dorothy Wen for your gift of a compassionate daughter. Need girl name based on California state or street names. Last name Holt. Hooray for Hollywood! Your daughter is going to be a star. I give you Beverly Sunset. My husband and I are having problems with naming our baby girl. We have already chosen a middle name, Kasha. Our surname is Grabowski. We would like another name with a Polish origin. I have many Polish names to choose for your little girl. I keep them in my Pole vault. I have selected Priscylla Kasha for the next little Grabowski.